Griffin Endeavors Ltd. is a residential construction and renovation company based out of Fredericton, NB. Our desire for attaining excellence flows from our initial customer relations through to our talented employees on the job sites. We know how much details matter. Since each project is unique and individually designed for our clients, we are more than happy to meet with you to discuss the specific goals that you have for your home. Griffin Endeavors will then provide you with a cost estimate of the project. As soon as you are ready to move ahead with your renovation or build, you will be presented with a contract and an easy to navigate work order so that both parties are in complete understanding with regards to a payment schedule. Perhaps you have frustrations with your house and you aren't sure what the next step is. With a designer on staff, we are able to offer 3D computer generated images and virtual walk-throughs to help you visualize how your house is going to look and feel when it is complete. We are problem solvers. 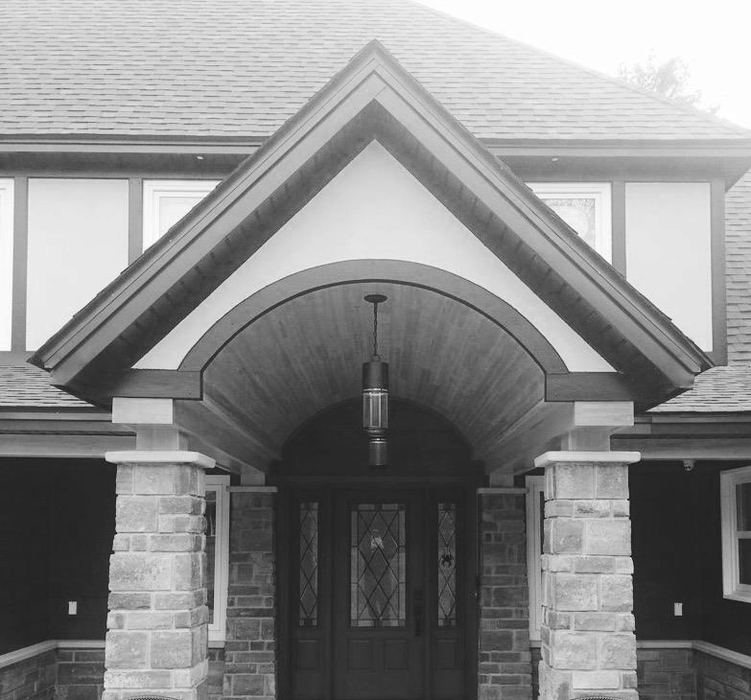 "...Eric is a highly motivated and skilled craftsman providing his clientele with professional and outstanding “design, build and/or renovate” approaches. Complimenting Eric, is his team of professional craftsmen and builders. At all times, we found Griffin Endeavors to be honest, trust-worthy, dependable, and hard-working in his business ventures, providing excellent service to their clients... The work done on our home [basement and stairway renovations] has been exceptional, where they took the time to consult with us on each step of the project resulting in a successful and satisfying completion..."
"We were first introduced to Griffin endeavors when our contractor walked out on us before finishing the work that he had been paid for. Eric's crew were professional, clean and it was obvious that they took pride in their work. This year when our basement flooded we contacted Eric once more. He provided us with a detailed and competitive quote. We found that Eric's work crew still had the same qualities and values as before. If you're looking for quality workmanship at a competitive price as well as a work crew that doesn't walk through with muddy boots on, I would definitely recommend Griffin Endeavors for any and all of your renovation projects." "Eric and his team completed a significant renovation to our existing garage. The team was great to work with! They were always on time, courteous, and both willing and ready to speak about and collaborate on the timelines, progress, and decisions needing to be made. The work was completed with care, and each day the crew took time to cleanup before leaving – a much appreciated small detail. Overall, we had a great experience working with Eric and his team, and we’d highly recommend (and have many times!) their services." "Their workers are diligent, very professional, and courteous, and cleaned up the debris after each day of their work. They spared nothing in their attention to detail. They have a very fine and honest boss. And the rate was marvelous. What a pleasure to have seen good workers - always on time! If all companies and workers were like that, it would be a wonderful example to children and others." "When I decided to carry out renovations to my four rooms in the upstairs of my house, I interviewed many contractors over the course of one-year. I was becoming quite despondent until I made arrangements to meet with Eric Griffin of Griffin Endeavors and to my delight my quest for finding the right person for the job immediately ended. Eric and his team are wonderful to work with; never rushing you into making decisions that you may regret down the road; always patient, polite, professional and furthermore, reliable. I could not believe the transformation; Eric's carpentry skills and careful supervision is unsurpassed and I have no hesitation in recommending Griffin Endeavors for all your carpentry/renovation needs - I know you will be as happy as I am." "Being a dedicated Do-It-Yourself renovator for my home, I was reluctant to engage the services of a contractor to take on some of my bigger projects. I was unsure if I would find someone who was completely trustworthy and provided workmanship to the high level I expected and needed. Griffin Endeavors has more than exceeded my most optimistic expectations. They have provided superb workmanship for a recent bathroom renovation as well as replacing my shallow sloped roof with a much steeper one. In both cases, I could not have been more pleased with the results and I would highly recommend Griffin Endeavors to anyone needing excellent quality workmanship for their home." -Gordon J.W. Boneschansker, M.Eng., P.Eng. “Griffin Endeavors has undertaken renovations at our home over the past three years, totaling approximately three months of “on-site” work. Throughout that time Eric and his entire staff consistently demonstrated a high level of professionalism, not only in the quality of work performed but also in their punctuality, cleanliness, manners, and pride in workmanship. We did not leave the home while the renovations were ongoing ; subsequently we were able to observe first-hand the work ethic displayed by Eric and his staff, as well as the considerable effort they made to minimize disruption to our daily routine. I would have no reservation in recommending Griffin Endeavors to anyone, and already have on several occasions." “I have had several instances where I was in need of repairs and upgrades to my home and hired Eric and his team for those. In each circumstance, they were on time with the finish of the work, neat and cleaned up after themselves and were extremely courteous. I was impressed enough to recommend them to my 94 year old mother for some of her reno needs and she was not disappointed. Griffin Endeavors is at the top of my list when I need something done. You will notice that I haven’t said anything about price. That’s because when service and quality of work are as good as I have received, price is not my first concern any more. But even then, they are fair and reasonable, so I win either way." “I am pleased to share my experience with Griffin Endeavors. My renovations included creating a new hardwood stairway and railing system and railing for the kitchen/ family room. This renovation included removal of carpets. Griffin Endeavors was able to match the oak hardwood color perfectly to my kitchen cabinets. My upstairs hallway was also renovated with hardwood floors. All of the carpenters were very professional and I felt comfortable in my home with them working. I trusted them and I came and went as I needed. I would highly recommend Griffin Endeavors and plan to have them do future renovations to my home." "We were more than satisfied with Griffin Endeavors' total renovation of our main bathroom. Eric's creative ideas made efficient use of what was a very awkard space. Griffin Endeavors was a pleasure to work with - polite, always tidy, conscientious, and careful to maintain a high quality of workmanship. We highly recommend Griffin Endeavors and would be happy to consult them again for future home renovation needs." “I'm very pleased with my kitchen. [Eric] did a great job of bringing everything together and keeping on top of the "small stuff". I felt I was in good hands!" “I am extremely pleased with the work that Griffin Endeavors performed at my residence in Hanwell. Eric and his crew of very clean and efficient construction pros were at my home for a week and while the work was being performed the job site was always clean and safe. The crew were always mindful of where to park the equipment and I never once heard any foul language nor did I ever see any waste. When I would walk out to inspect the work out of curiosity, I was always greeted with a friendly "hello" and a brief conversation and explanation of what was being done. When the work was complete and the site was clear I was impressed to say the least. The work completed matched the quote and price. Payment was so easy too, all I had to do was e-transfer the funds and Eric sent me the receipt. I highly recommend Griffin Endeavors for any work around your home, business or cottage. "Nowadays it can be a real challenge finding experienced contractors that do quality work, start and finish a job when promised, all at a fair, agreed upon price. Based on my experience the Griffin Endeavours team get a check mark in every box and have been a true pleasure to deal with." "Griffin Endeavors replaced and expanded our front step into a beautiful small deck. The deck is structurally sound and adds great curb appeal to our house (it looks awesome). The job was done on time and within budget (gotta love that). When the job was done, the site was cleaned up and left in great shape (nice!). Can't wait to dig up the chairs and start enjoying our new deck. Thanks so much Eric!"